After a brief trip to the UK and an extended stay in Canada we are back on board. Again, kudos to Mags. The witches brew of vinegar, tea tree oil and bleach, well, not actually mixed together but applied in her own special way, worked its magic. The boat was immaculate on our return. No mold, mildew or cockroaches, thank goodness. I must get her to do a “Putting your boat to bed” blog. We had a fabulous stay with Mags’ cousin Ann and her husband Tom in Old Roan outside Liverpool. It was great catching up with Teresa and all the cousins right down to the youngest, one month old Joseph. 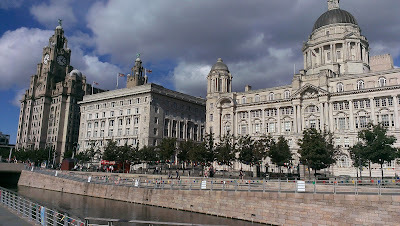 We had some great excursions into L’pool with Emma and David. The city has reinvented itself! Clean streets and refurbished buildings and a cultural pride in all the locals. We really enjoyed it. Ann and Tom took us on a pleasant walk on public paths through farmer’s fields and along the old tow paths beside the Liverpool to Leeds canal. Later, Sue took us for lunch at a rural Pub on the canal that exuded a charm of antiquity with canal boats travelling up and down. Although I had often heard about the canal narrow boats and the growing popularity since the 1970’s and 80’s, I was not prepared for the beauty and serenity of the canals and the absolute artwork presentation of many of the narrow boats. Mags and I were kids in a candy store helping open the locks and talking to the boat Captains. Definitely a different experience than our transit of the Panama Canal. From L’pool we drove down to Wiltshire see Mags’ former roommate Sue from their youthful London days. She and her partner David have an old house beautifully refurbished in the tiny village of Bishop’s Canning. The village has more thatched roofs than not so you are stepping back in time when you step out the door. Again, we were out on the public paths finding long boroughs and remnants of construction dating to the druids. Caen Flight, 16 locks on the Kennet and Avon canal. after you have filled or emptied the chamber. And of course, following canal paths and playing on the locks and stopping at canal side pubs. 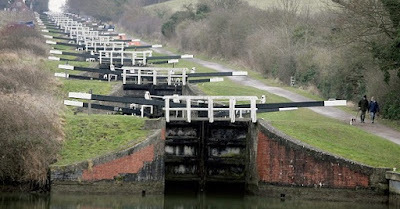 The Caen Locks, built in 1810 at Devizes on the Kennet and Avon canal, have 29 locks in two miles for an elevation change of 237 feet. 16 locks are placed in tight succession up a straight staircase. Sue and David's home was centrally located for side trips to Stonehenge, Woodhenge, Ashbury and Bath. For a west coast Canadian, the historical significance of these sites dating to the druids and Romans is awe inspiring. After several days with the girls reminiscing and interesting conversations of travel and the state of the world we had to leave to return to L’pool. We hope one day to return their hospitality on the boat or in Canada. Our final road trip was to the south central highlands of Scotland with Ann and Tom. We had a beautiful drive up and then a lot of exploring the minor one lane roads. Our cottage was in the country between Pithlochry, Blair Atholl and Aberfeldy and yes, more than a few drams were tested from the local distilleries, Edradour, Aberfeldy and Blair Atholl, all serving the single malt nectar of the Gods. Beautiful country but too short a visit. On our return drive to L’pool, about midway between Edinburg and Glasgow we stopped in the town of Falkirk, now famous for the Falkirk Wheel. Google it. It is the most modern thing to happen to canal traffic in the last several hundred years and due to the cost will probably never be replicated. Essentially it is a 75 foot diameter ferris wheel with two long bath tubs as the conveyance modes. The two long bath tubs line up with a canal at the higher elevation and a canal at the lower. You simply enter the tub, they close the water tight gates and then by rotating the wheel either lift you or drop you to the other canal. This replaced about 1.5 miles of canal and I believe six locks. 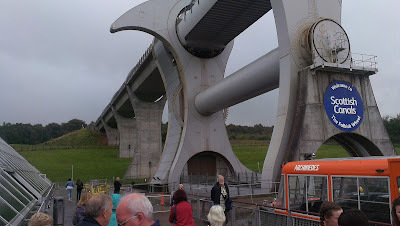 Of course we had to take the tour boat up on the wheel, through a tunnel, (yes, they have canals running thru tunnels!) to the next traditional lock and then back to the wheel and down. Needless to say, Mags is now having to put up with my scheming to spend a couple of years with a canal boat as a way to decompress from ocean cruising on a sailboat. As I’ve pointed out to her, there has never been a canal boat washed up on the beach by a hurricane. The bulk of our time away from Kanilela was spent in British Columbia. We had a wonderful time catching up with many friends whose names I won’t list for fear of forgetting someone. We were held captive by two little girls who made our stay magic, especially through Xmas when we had a family gathering with Bree and Matt coming from New York and all staying with Dustin and Cheryl. Vancouver has had the coldest winter in more than 30 years with snow on the ground for more than seven weeks. The most unusual aspect was clear blue skies for days in a row with temperatures staying below zero, more like Montana or Alberta than Vancouver. We miss our granddaughters but the weather here in Bocas is very nice. The A/C is not essential as it was back in July, August and we have only had a couple showers two nights ago in the four days we have been back. I will do a brief post on our short stay in San Jose, Costa Rica in the next few days while we prepare the boat for a trip north to San Andreas and Providencia.